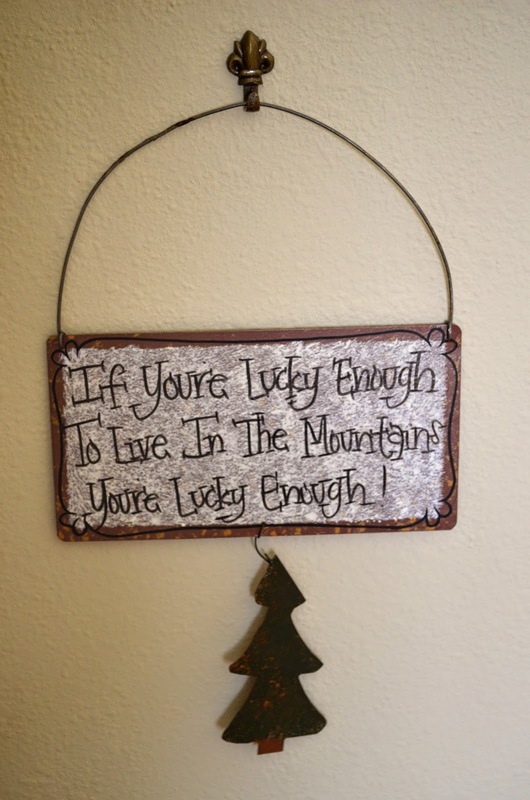 “If you are lucky enough to live in the mountains, you are lucky enough!” These are the words on a plaque near my front door. I see it daily, and I often read it and think about what it says. Driving home from town with a beautiful snow-capped mountain range visible through my windshield, working in my garden, or watching the sun sink behind a mountain peak, this phrase sometimes suddenly pops into my head. I am grateful to live in such a beautiful place. . .
... Sorry - there was a bit of an interruption just now. I need a second to take a breath, and get back in the frame of mind I was in before I left off! A minute ago, my son picked up a bug crawling on the floor of his room, and brought it out to show me. Yup - it was a TICK! It must have hitched a ride into the house, and then dropped off of the dog or one of us. (We were all working outside and around trees and tall grasses today.) This is definitely one of the less appealing moments of living in the mountains. I am unfortunately not writing this for any sort of dramatic flare either -this really just happened! When I think about my wall hanging, I realize not everyone would agree with what it says. Some people might argue "if you live in NYC, you are lucky enough ... or by the ocean ... or in Europe ... or the prairies ...or ...(fill in the blank). I have lived a lot of different places in my life, and have found something to love about every place I have lived. Every place has merit, yet that merit may not suit every person. Many people are extremely loyal to Montana, and enjoy living here immensely. My family and I fall in that category. Another local expression “Montana, The Last Best Place” is prominently displayed in my home as well. Most people enjoy visiting Montana. But not everyone wants to live here. Montana. The last best place. Some people don't like that there is only a limited amount of shopping and dining options in many parts of Montana. Or the extreme temperatures here. Or the forest fires that can make the air smokey a lot of the summer. Or worrying that when you visit a friend you will get stuck - or slide off their icy, steep driveway. Or - the TICKS! However, many of us who live in the mountains of Montana really do feel lucky enough. If you're lucky enough to live __________, you're lucky enough! Hi Amy, I love the ocean too and would be happy living on the coast. Our world is a very pretty place! Montana is green right now but in a week, our grasses will start to brown. We live in a semi-arid climate, so drought and forest fires are often a concern. Alabama is a state I haven't spent much time in - but it sounds like a nice place to live! We love Montana - it's one of the places I think we would go if we didn't love Seattle so much! Although I could do without the ticks - yuck! Great post! And since so many of my family live within a few hours of Seattle, we get a lot of encouragement to mover there! The combination of the mountains and the ocean is perfect - but I'm not sure about the traffic! I love to visit though! Speaking of bugs, there is a conspicuous absence of flying insects here in the San Francisco Bay Area. The weather is famously temperate, so I would expect there would be more mosquitoes, but there just aren't. So, even though it costs $1000 a month to rent a studio apartment in a bad neighborhood, at least you can sit motionless for five minutes without getting eaten alive. I noticed that when I was in the Bay area. Actually, unless you are near a river or stream, Montana is pretty mosquito free as well. A fact I REALLY appreciate! I lived in Las Vegas for 20 years and it never felt like home. I've been living in Raleigh for a year and within a few months I knew I found a home. Yaww!! Ticks! Used to live in Montana now Arizona, it's hot. I am happy anywhere my family is so it's all good. Home is where the heart is! Where in Montana did you used to live? Hi Susan! Visiting from SITS! Montana sounds beautiful! We have ticks too here in SE Pennsylvania. I love the beach, so I would answer: If you're lucky enough to live at the beach, you're lucky enough! Yes - I think living at the beach would be wonderful too! I lived in Pennsylvania for 5 years, and loved that part of the country too. Montana is so wonderful! My husband grew up there and we visit as often as we can. We live in Colorado so no complaints here. Just found your blog; it's beautiful. Thanks for your nice compliment, Susan B! I hope you visit often! Where in Montana did your husband live? We will be visiting colleges in Colorado soon, as my son is considering going there! We are both lucky to live where we do!